God‘s glory is on tour in the skies, God-craft on exhibit across the horizon. 2 Madame Day holds classes every morning, Professor Night lectures each evening. Sunrise and sunset are glorious moments with spectacular colors painted across the skies. God often presents us with masterpieces that I do not even notice. Yet, they are silent love letters to us, His creation. 3 Their words aren’t heard, their voices aren’t recorded, 4 But their silence fills the earth: unspoken truth is spoken everywhere. The Great Artist’s handiwork is everywhere and His signature must be the roses. Every good and beautiful thing God made testifies of His truth – His goodness, His mercy, His justice, His love. God makes a huge dome for the sun – a superdome! 5 The morning sun’s a new husband leaping from his honeymoon bed, The daybreaking sun an athlete racing to the tape. 6 That’s how God’s Word vaults across the skies from sunrise to sunset, Melting ice, scorching deserts, warming hearts to faith. God gives us incredible moments that cause us to stand in awe of who He is, and what He has done for us. 7 The revelation of God is whole and pulls our lives together. The signposts of God are clear and point out the right road. 8 The life-maps of God are right, showing the way to joy. The directions of God are plain and easy on the eyes. God’s Word is beauty! He speaks to us, warns us, shapes us, fills us by His mighty Spirit whispered through the words of life. Oh, that I would fall more in love with His Word that I might know Him better! How my life is improved by sitting at His feet! I have so much to learn but it scares me to think of where I would be without the Word of God in my life! 9 God’s reputation is twenty-four-carat gold, with a lifetime guarantee. The decisions of God are accurate down to the nth degree. 10 God’s Word is better than a diamond, better than a diamond set between emeralds. What God has for us is the best – even when times seem like the worst. His Word promises that all things work together for those who love God and are called to His purpose. What precious promises in the Spring, Summer, Fall and Winter of our lives! You’ll like it better than strawberries in spring, better than red, ripe strawberries. 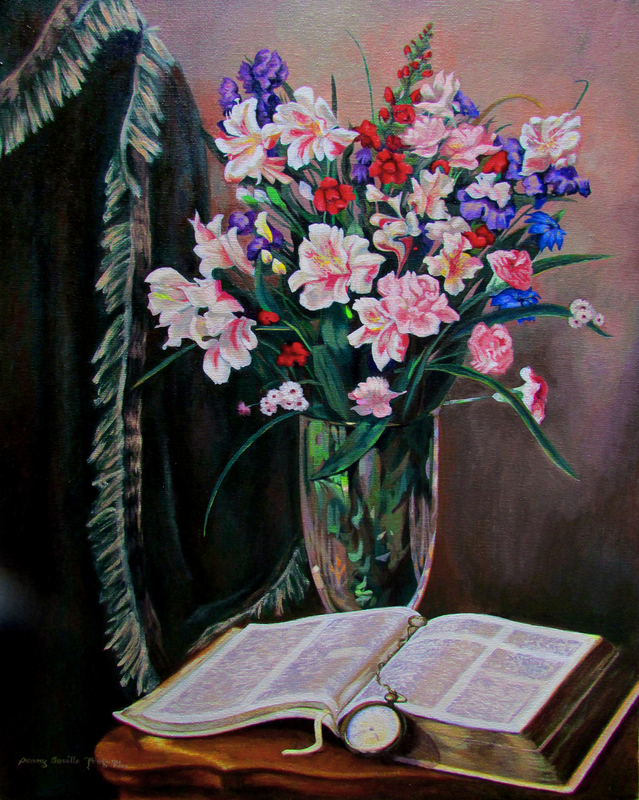 Some of my favorite things – an old pocket watch, cut crystal, an antique oak table, a treasured old blanket, beautiful flowers point to a love for God’s Word. His Word is a treasure. Oh Lord that I would delve into Your Word more deeply that I might know You more and more! 11 There’s more: God’s Word warns us of danger and directs us to hidden treasure. 12 Otherwise how will we find our way? Or know when we play the fool? Yes! Decisions based upon Your Word give me peace of heart and mind. Decisions that I make based on my own way of thinking can get me in trouble! You tell us straight out what is right and wrong and how to keep our feet on Your road. Hold me tight Lord – keep me hungry for Your Word! 13 Clean the slate, God, so we can start the day fresh! Keep me from stupid sins, from thinking I can take over your work; Then I can start this day sun-washed, scrubbed clean of the grime of sin. Thank you for the freedom of forgiveness! You alone suffered and died in my place so that I might come before you clean – not because of me, for I am a sinner saved by grace. No, it’s all because of You! 14 These are the words in my mouth; these are what I chew on and pray. Accept them when I place them on the morning altar, O God, my Altar-Rock, God, Priest-of-My-Altar. Thank You for Your Word, O God. It points me to You – the God who knows me completely, and still loves me! Amen and Amen!